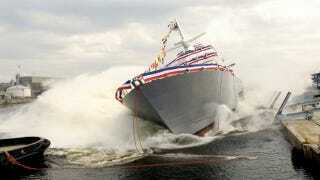 Why is the US Navy's ultra-modern Littoral Combat Ship a failure after five years? Wired's David Axe has the answer. The Littoral Combat Ship was supposed to be a light, disposable ship that could operate on the coastal waters where most modern naval fighting happens. It was going to change the fleet from lead-footed bruisers into a collection of fast-acting commando ships that could re-outfit on the fly. In practice, "instead of compact, brute-simple coastal brawlers" we got "over-inflated, gas-guzzling, gutless ships dependent on ultrahigh-tech gizmos." Not good.